(Newser) – Whale watchers off the coast of Washington saw a welcome sight last week—a killer whale nicknamed "Granny" who is believed to be an astonishing 105 years old, reports the San Francisco Chronicle. Granny's more formal name among scientists who have studied her for decades is J2, and a post at the Orca Network uses both names in the original post about her sighting: "J2 Granny (oldest southern resident orca) looking gorgeous. 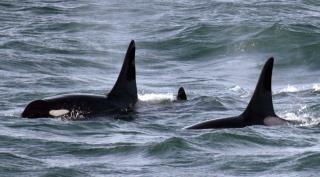 She and J27 spent more time out of the water than in it!" The link includes multiple photos of her leaping from the water. Female orcas typically live about 50 years, notes a post at the NOAA, but a rare few have been been known to reach 100. Amazingly (and I only learned this recently) the Greenland shark reaches sexual maturity at 150 years of age, typically lives at least 270 years and can often live to 400. There are such sharks alive today who were born before Shakespeare died and before the Pilgrims had dinner with the native Americans. They were over 200 years old before the Civil War started.